Green beans are a popular side dish at our house and this is one of the most requested ways to serve them. 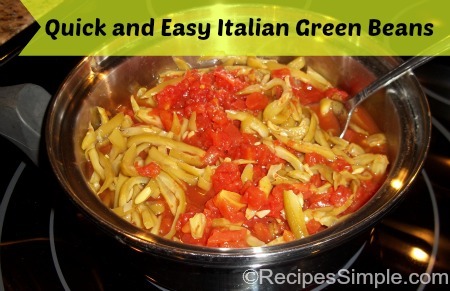 These Quick and Easy Italian Green Beans are delicious. It’s almost too easy of a recipe to post but I know a lot of others like me need quick side dishes to get on the dinner table. You can use any style bean you like. I usually have French style beans in the pantry so that is what I used. Heat 1 tablespoon oil in nonstick skillet on medium-high heat. Add onion and garlic. Cook and stir 2 to 3 minutes or until onion is crisp-tender. Add green beans, tomatoes and seasoning and stir lightly. Cover and reduce heat to medium-low. Simmer 10 minutes until mixture is heated through. Sprinkle with Shredded Parmesan Cheese; cover. Cook an additional 2 minutes or until cheese is melted. I’d like these, I already know it! I am trying this recipe today . And it sure does smell good. And it is very yummy. Also easy and quick to make.